New iPad 5 and second-generation iPad mini coming in March? Apple preparing an iPad update just five months after the last? 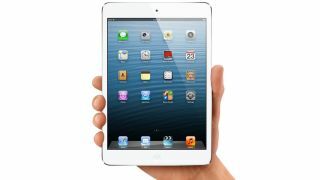 Apple will refresh its iPad line in March, with a new iPad 5 and iPad mini 2, according to one analyst. Brian White of Topeka Capital Markets is convinced that Apple is now working on a bi-annual update schedule, meaning a launch in the next couple of months. In a note to investors, White said his checks with industry insiders at the CES expo in Las Vegas have tallied with suspicions that new 9.7-inch and 7.9-inch tablets are already on the way. However, any March update wouldn't be without controversy as the first iPad mini and the latest full-size iPad 4 only arrived in October 2012. According to White's sources, the new full-size iPad will be thinner and lighter than its predecessor and also boast an improved A6X processor. The iPad mini 2, on the other hand, will keep its form-factor and improved innards. White made no mention of the heavily-rumoured Retina Display for a second-gen iPad Mini, but we can't imagine Apple updating this product without improving the disappointing screen resolution.